Ever since I became Vegan, I’ve been oddly conscious of how much leafy green veggies I take into my body on a daily basis. I guess you could even say I’ve been OCD about getting my greens. I will always try to have some type of vegetable dish as part of any meal, but I love making green smoothies in the morning so I don’t have to worry about my intake for the day. 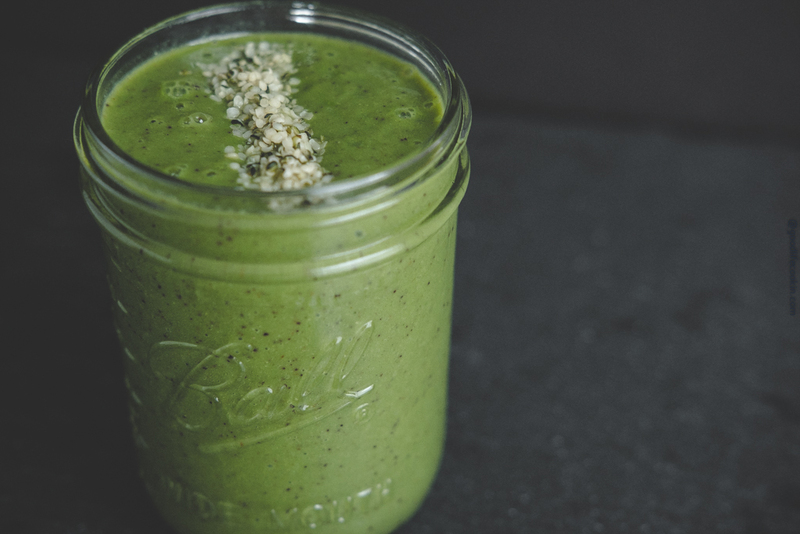 If you come to the end of the day and you’re feeling a little tired, green smoothies can also give you a huge jolt of energy and it’s fantastic. For my green smoothie, I simply pack two cups of spinach in with apples and bananas. These three ingredients are really the foundation to what makes a green smoothie super delicious! I’m fortunate to have an apple tree in my backyard. The apples have definitely come into fruition and there are a ton of them! The thing about San Francisco apples is that they are very tart! That’s okay for this application because the tartness balances out the sweet. For additional tart, I also use some fresh squeezed lemon juice. To prepare the Medjool dates, Just press them to pop out the seeds and throw them into the blender! I will also lean on flaxseed to get my omega 3’s in. I honestly put flaxseed in everything I eat for breakfast so feel free to load this up into the smoothie however much you’d like! I found this interesting coconut beverage at Trader Joe’s that’s been growing on me for use with smoothies and breakfast cereals. This particular one is fortified with vitamin B12 and vitamin D. It taste great and is a little creamier than your typical unsweetened almond milk. Adding a splash of vanilla extract to give the green smoothie some POP, and we’re ready to blend this bad boy up! I know there’s a ton of blenders out there, but I can’t tell you how important a really good blender is for making smoothies. I’ve used an array of cheap blenders, to mid-ranged blenders, only to finally end up with a Vitamix. Which I’d say lives on the higher-end side of the blender world, but it’s definitely been a life changing blender for me and the investment has paid me back tenfold. I can throw anything in this bad boy, and it will pulverize the $hit out of it. You will always get a finish that is so smooth and unbeatable. This is super important when we’re trying to extract and gain the most nutrients out of the ingredients we use! We’ll top it all off with some hemp seeds to give some protein and more omegas. The finish product is always so refreshing, rich with nutrients, and life saving…or so I feel like it is. It’s like being lit up with magic powers to kick off your day. Nothing beats that! A healthy green smoothie featuring spinach, bananas, blueberries, apples, and coconut milk! Rinse spinach, blueberries, and apples. Cut apples into quarters and discard the core. Remove seed from dates. Add these ingredients into blender with juice from one whole lemon. Add all remaining ingredients into blender and blend. Top smoothie with hemp seed and enjoy!